In this series of reviews, we have acquired five eBay flash triggers in a quest to find the greatest on the market. In later editions we will cover various features of these triggers including functions, reliability and range. Firstly, which is the fastest? An important consideration for flash photographers, especially when shooting outdoors, is the maximum sync speed available. With a faster shutter speed, less power is needed to overcome the ambient light, providing more creative choices. Radio trigger circuits will delay the flash triggering signal by a fraction of a second, causing the maximum sync speed to be slower. 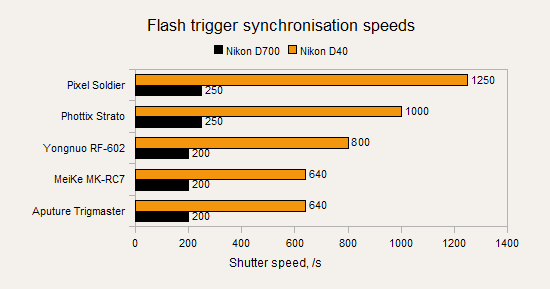 The graph below shows the fastest shutter speeds reliably achieved by each type of trigger before banding or mistimed exposures occur. I tested a Nikon D700, which has a mechanical focal-plane shutter (with a rated sync speed of 1/250 s), and a Nikon D40, which uses an electronic shutter at speeds up to 1/4000 s.
The majority of photographers will be interested in the D700 results as electronic shutters are rare on DSLRs nowadays. The graph shows not much separating each brand of trigger in this category. At 1/250 of a second, the Yongnuo RF-602 shows almost unnoticeable dark feathering at the frame edge. The MeiKe MK-RC7 and Aputure Trigmaster present a more distinct bar. If you want a radio sync speed that matches the rating of your camera then the Pixel Soldier or Phottix Strato are the best choices for the task. Compact cameras and certain older DSLRs use electronic shutters allowing you to sync at any shutter speed. The delay from the radio triggers will push the flash out of the exposure at the very highest speeds. In this test, the Pixel Soldier performed the best of the five triggers with a consistent 1/1250 s, with the Phottix Strato not far behind at 1/1000 s. The cheapest triggers provided 1/640 to 1/800 of a second. After our first test, the Pixel Soldier TF-37X is the fastest with the Phottix Strato in a close second place. Watch out for upcoming reviews exploring other aspects of these triggers. To learn more about flash triggering in general, have a look at our flash triggering guide.